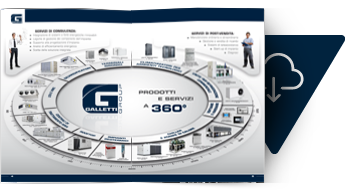 The Galletti Group’s roots reach back to 1906, the year Galletti S.p.A. was established, one of the first companies to become involved in the air conditioning market in Italy. The Group originated from a small group of successful managers in the air conditioning sector who, beginning in 1995, by means of the creation from scratch of new companies and through the acquisition of other companies, gave shape to a market force that presently possesses 7 different brands. Their large intuitive idea was not to establish a single company with a catalogue containing a large variety of different products, but to create seven different companies, each with its own specific expertise in the target sector, that work in perfect synergy with each other so as to be able to present themselves on the market as a single partner. The Galletti Group’s great strength in all these years was to keep in-house the strategic processes that are the pillars of every new solution. The growth of the Galletti company and the evolution of the market opened the way for six other large companies to join the group, with the goal of presenting themselves in the air conditioning sector as a single committed partner. Thus was established the Galletti Group. Each company in this synergetic relationship has a well-defined identity with specific expertise, to provide a complete range of services to the customer. The willingness to keep strategic processes inside the company is the key to success of the Galletti Group, which has been able to maintain constant growth over the past few years due to its considerable investments.